This summer has seen parts of Galicia decimated by fires, similar to those shown in Portugal on international TV and we, like so many others, were unfortunate enough to get a close look. The source and reasons for these fires is unknown, but a Galician news report we watched stated that there had been more fires in the last seven months than the previous 10 years. Rumours abound regarding the deliberate setting of these fires. Some suggest that the value of timber, change of use of land and other land owner interests may motivate a deliberate policy by some individuals. Another popular rumour is based on the deliberate setting of the fires by the foreign pilots of the planes used to douce them. The explanation behind this being that the pilots are paid on a "use as required" basis. At the end of August one of these pilots was taken in to custody for questioning in connection with these claims. 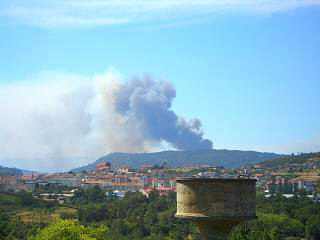 This picture shows the early stages of what became a bigger fire near Ourense. A further news item we saw reported the emergence of seven new major fires in a single day, but amazingly, we counted no less than eight separate fires in the Noia and Muros bay area on the very same day. First hand experience is usually a good thing, but not in the case of fires. On 21st August we got caught up in one as we returned from a day in Ourense. As we traveled back to our base we noticed that much of the smoke, that we had seen pluming up and then horizontally across the horizon, seemed to be originating from our destination. By the time we were within 20km, there was a near stationary queue of traffic heading against our direction of travel. We continued and, as we were surrounded by thick smoke, anticipated that the many police and fire fighters (by the road side) would turn us around. They in fact did the opposite and kept signaling us to continue, even as the fire burnt within a few feet of the road. We did make it back safely, but I would be lying if I said we were not slightly concerned. A similar occurrence happen a couple of days later. We went to visit a cascade (waterfall) and this time realized a new fire had jumped over the hill above us and was moving down the slope towards the path we were now walking on. We made a quick exit, but noticed as we drove back that a lady, to whom we had spoken to earlier, had now called the fire brigade as the fire approached her house. 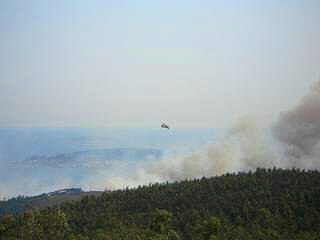 This photo shows one of the planes used to control the fires. The planes scoop water out of the bays and then release it over the fires. On one afternoon we saw two of these planes make twenty one separate visits to pick up water near a local beach. Apparently each one can carry up to 5 metric tones.